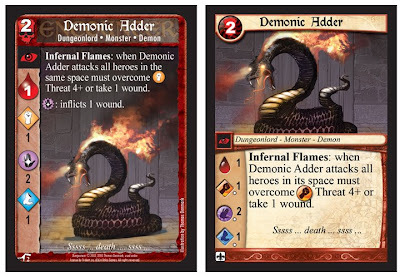 On the left is the classic Demonic Adder from the Tomb of the Lich Lord set, on the right is the RPG version. Making revisions is always hard, in particular something as important as an established interface design. But the classic card face design has been needing an overhaul for some time. 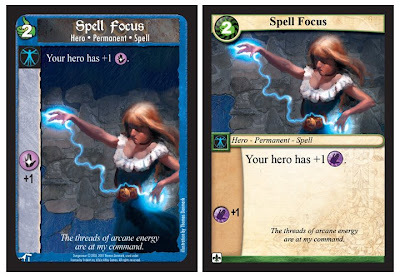 When I first designed the card face my main concern was showing art much larger than your typical fantasy card game had. In this end I bled the art behind the text. While I thought I was being clever, it made creating the art extremely challenging. Every composition had to have an enormous "dead space" that didn't compete with the text. In addition that space had to be dark, since the text was always white. This has hung on my neck like an albatross through the various sets. Since the RPG is such a radical departure, I wanted to make the cards distinctive as well. This is an RPG that uses cards - not just another Dungeoneer XCG set. So I took the opportunity to redesign the face. I've posted earlier versions of this design, but this has been polished even more. The mechanical information is all grouped together now and there is more detail. This time I show it side by side with it's XCG counterpart so that you can see the RPG is 100% compatible. I'm not saying this is the final design - I may play with the art to text ratio a bit more, there probably is room for larger art, the text hear is still a bit large. But I like the legibility. One improvement you may notice is the text stating "inflicts 1 wound" is gone. It has been replaced with a little "hit" symbol next to the stat. This cleans up the card as well as providing better information. The other thing you may notice is that I've been enhancing the melee/magic/speed symbols. These are still being worked on, but I feel these are more contemporary in their quality. In this one you may notice the border is green instead of blue. This is because we found that generally the Boon/Bane/Encounter/Treasure identification was clear enough by the symbol placed next to the playtime - duration - category text, and that the Peril/Glory identification was critical on first glance. A Roleplaying Game is a game in which the participants assume the roles of fictional characters and are rewarded for making choices that are consistent with the character's motivations or further the plot of the story. Participants collaboratively create stories by determining the actions of their characters, and these actions succeed or fail according to the rules and guidelines. Within the rules, players can improvise freely; their choices shape the direction and outcome of the game. I don't know if I've succeeded, in fact posting it here has made me aware of how esoteric this sounds. Your thoughts? Dungeoneer is an expandable, non-collectable, card game that captures the feeling of a classic fantasy role-playing game in a fast-playing card game. It is set in the grim fantasy world of Tarniss.